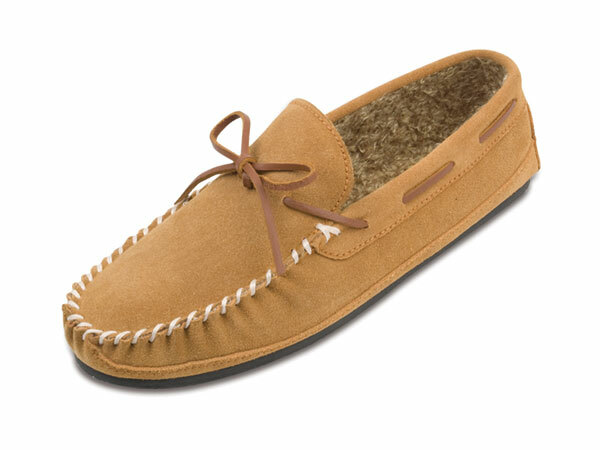 Enjoy the traditional moccasin both indoors and out with the Minnetonka Casey Slipper - a men’s classic, casual comfort. Perfect for around the house or a quick run out for the paper. The slipper features warm shearling linings for extra comfort, and its tractioned sole can be used indoors or outdoors. Its suede upper, slotted collar, and detailed stitching proves that you can look sophisticated even in the comforts of your own home. Featuring authentic, Native American-inspired style, the genuine suede upper of this men's moccasin-style slipper has moc-toe stitching details for an authentic look. A cushioned footbed softens every step with slipper-like comfort, while the Minnetonka Casey Slipper features a rubber sole for flexible grip indoors or out. A great gift for Father’s Day, dad’s birthday, or special occasion. It’s the perfect “guy slipper” moc! Learn more about the Minnetonka Casey Slipper. To order, Contact MoccasinsDirect at 866-317-2975 during regular store hours Monday thru Sunday 10 to 5 EST for current available sizes and to place an order. Also, you may inquire about sizing and availability at any time day or night, via email. Free shipping on 2 or more items.